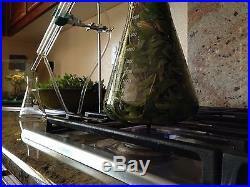 2000 ml Basic Oil Distillation Kit. Instructions must be accessed from Physics Playground. If you are looking for a simple at home oil distillation unit that is easy to operate, easy to clean, and does all of the distillation processes as the other units (plus hydro distillation) at a fraction of the price, then you have come to the right spot. This unit is similar to the vertical distillation kits because the plant material sits directly on top of the heated water which is passes directly though the leaves and into the condenser. The advantage is these are much easier set up, tear down and clean plus they don't tip over. In addition, this is a kit that I Mr. Graff from TUSD California have designed for my classroom and have been successfully using it now for 5 years with my sophomore classes for lavender and mint oil distillation labs. If the kids can do it, so can you! 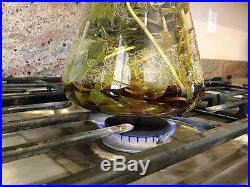 1 Add the plant material into the flask along with 500 ml of water. 2 Next, connect the food grade silicone stopper and tubing to the flask and condenser as seen in the illustrations and then begin to run water through the condenser. Make sure the silicone stopper and the top of the large flask are extremely dry so it does not become loose. 3 Making sure the condenser has water flowing through it, begin to heat the large flask until the water starts to boil and then turn down the heat. You want a nice cool slow and steady drip coming out of the condenser. Continue to heat the flask for 30 minutes. To separate the oil from the water, just add water to the small flask so that the oil sits at the mouth of the flask and then use a small dropper to pull out the oil. In short, pick and then steam it! 1 The faucet adapter is a nylon 3/4 GHT female connector. For those who dont know, this looks like an adapter that would connect to the end of a hose. For easier use, I would recommend adding the electric pump to this order. Each faucet is different so just double check before you order. 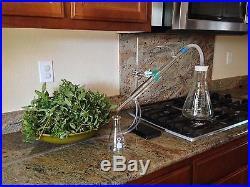 2 The easiest way to separate the oil by using a separatory funnel. Just pour the distilled solution into the separatoy funnel and drain from the bottom. 3 Please know that distillations take a little practice. Each plant has its own very unique properties so take baby steps at first. Silicone food grade stoppers and tubing. 10 ft of water coolant tubing. Faucet hook up for tubing going to condenser (Now replaced with 110V water pump). 3 collector bottles with droppers. 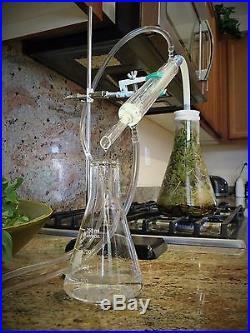 Separatory funnels are available for 22 dollars extra. Electric water pumps are available for 20 dollars extra. Just let me know and I will send an invoice. 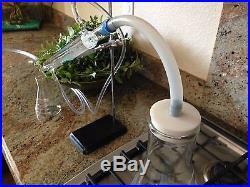 The item "Essential Oil Distillation Kit (Water pump included)" is in sale since Friday, October 14, 2016. 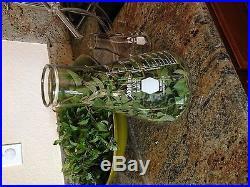 This item is in the category "Business & Industrial\Healthcare, Lab & Life Science\Lab Supplies\Lab Glassware". The seller is "physicsplayground2016" and is located in Manteca, California. This item can be shipped to United States, Canada, United Kingdom, Denmark, Romania, Slovakia, Bulgaria, Czech republic, Finland, Hungary, Latvia, Lithuania, Malta, Estonia, Australia, Greece, Portugal, Cyprus, Slovenia, Japan, China, Sweden, South Korea, Indonesia, Taiwan, South africa, Thailand, Belgium, France, Hong Kong, Ireland, Netherlands, Poland, Spain, Italy, Germany, Austria, Israel, Mexico, New Zealand, Philippines, Singapore, Switzerland, Norway, Saudi arabia, Ukraine, United arab emirates, Qatar, Kuwait, Bahrain, Croatia, Malaysia, Chile, Colombia, Costa rica, Dominican republic, Panama, Trinidad and tobago, Guatemala, El salvador, Honduras, Jamaica.